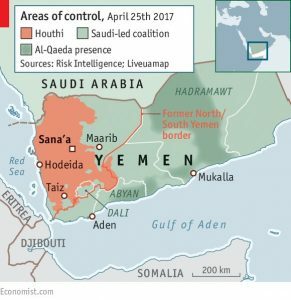 Yemen is a relatively new country within the political landscape of the Middle East that has faced enormous economic and political challenges since its unification in 1990. Before 1990, what is today Yemen was divided between the Yemen Arab Republic in the north and the People’s Democratic Republic of Yemen in the south. The causes of the current civil war–which the World Health Organization, the World Food Program, and UNICEF characterized in 2017 as “world’s largest humanitarian crisis”–largely stem from unresolved issues dating back to the country’s unification. Post-unification Yemen was marked by a massive disparity in income between populous north and impoverished, sparsely populated south. Tensions between the Saudi-supported Salafi religious movement and the Shia Muslim minority in the north have also increased in past decade. Separatist movements in southern Yemen and the Shia Muslim Houthi militias in the north seek to remedy these perceived injustices. In 2014, both of these groups revolted against the government of President Abd Rabbuh Mansur Hadi, who came to power after Arab Spring in 2011. The civil war in Yemen has increasingly taken on an international dimension. Saudi Arabia and most of the Gulf Cooperation Council backs President Hadi’s regime, the United Arab Emirates (UAE) supports the southern separatists, while Iran has contributed some limited military support for the Houthis in the north. The Saudi-backed coalition has carried out widespread bombing campaigns in Houthi-controlled areas. As the civil war in Yemen has increasingly been depicted as a proxy war between Saudi Arabia and Iran, the United States has taken a strategic interest in the conflict. The Obama Administration agreed in March 2015 to provide the Saudi military with intelligence sharing, air-to-air refueling, and logistics support in Yemen in exchange for Saudi support for the Iran Nuclear Deal. In September 2017, the United Nations sent a prominent team of international law experts to Yemen to investigate reports of Saudi war crimes. CMEP urges the U.S. to support human rights, humanitarian assistance, and ‘encourage negotiated, just and peaceful resolutions to conflicts in the region.’ Nowhere in the world is there a catastrophe today where so many lives could be saved by the U.S. adopting this course of action. S.J. Res. 54: A Joint Resolution to Direct the Removal of United States Armed Forces from Hostilities in the Republic of Yemen That Have Not Been Authorized by Congress. 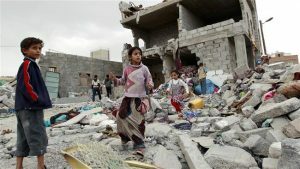 A bipartisan joint resolution sponsored by senators Bernie Sanders (VT-I), Mike Lee (UT-R), and Chris Murphy (CT-D) calling on the President to remove U.S. Armed Forces from hostilities in or affecting Yemen unless Congress formally declares war or authorizes the special use of armed forces. Churches for Middle East Peace joins 54 organizations in calling on U.S. senators to support S.J.Res. 54. The letter questions the constitutionality of the executive use of military force without congressional authorization and draws attention to the horrendous cost in human life the Saudi-led war has amassed.